Mathematical Methods in Nuclear Reactor Dynamics covers the practical and theoretical aspects of point-reactor kinetics and linear and nonlinear reactor dynamics. The book, which is a result of the lectures given at the University of Michigan, is composed of seven chapters. The opening chapter of the book describes various physical phenomena influencing the temporal behavior of neutrons to provide insights into the physics of reactor dynamics and the interrelationships between various diverse phenomena. The text then presents a set of equations, called point kinetic equation, which describes the time behavior of the total power generated in the medium. The book also provides a short discussion on Gyftopoulos modification and Becker’s formulation. The next chapters explore the exact methods for solving the feedback-free point kinetic equations for a number of reactivity insertions and the validity of the various approximate methods of solution. The book also examines the derivation of models for a certain reactor type and briefly discusses the validity of these models in certain cases against experimental data. A chapter focuses on a concise presentation of the stability theory of linear systems with feedback. Lastly, the concepts of stability in nonlinear reactor systems and the criteria for asymptotic stability in the large as well as in a finite domain of initial disturbances are covered in the concluding chapter. 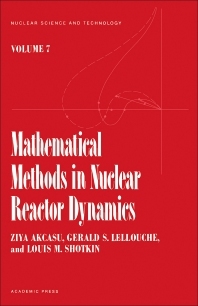 The text is an ideal source for nuclear engineers and for those who have adequate background in reactor physics and operational and applied mathematics.